Our weather has been so hot in the last week (90+ for over a week) so we have been using the pool alot. Brooks has no fear of the water. He jumps off the side without hesitation. While its fun to have a little one so excited about the water, it has made us nervous. 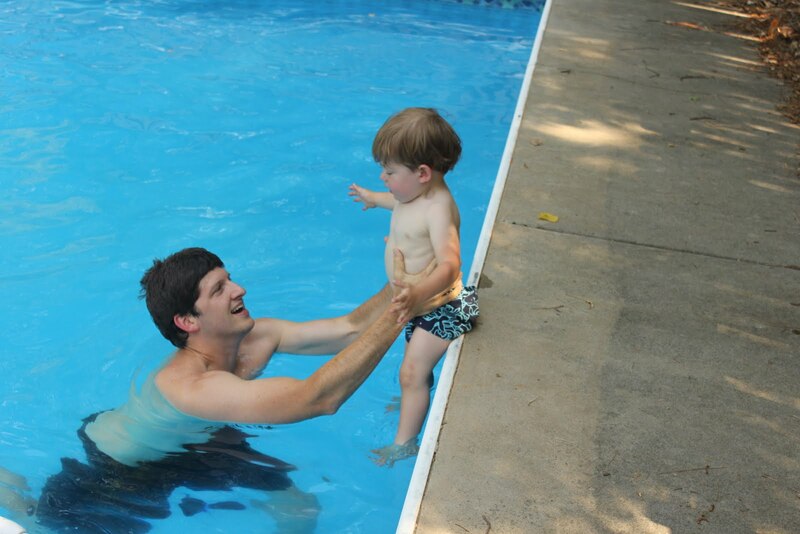 When Mark is home we sometimes head down to the neighborhood pool because Brooks loves to watch other kids. He goes back and forth betweeen the baby pool and the big pool trying to do everything the older kids are doing. 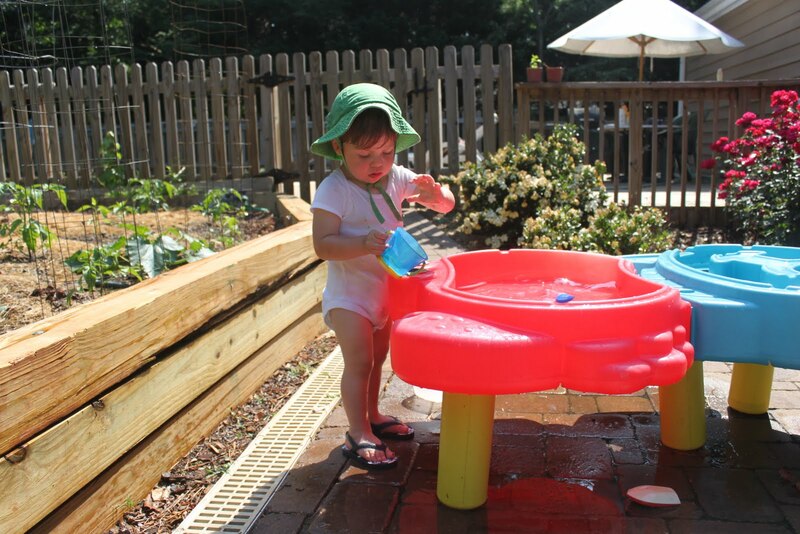 When Mark isn’t home to run afer Brooks around the pool, our water table has been a great distraction during these hot afternoons. Its nice because he stays entertained and waters our garden at the same time. This past weekend we were able to finally meet my niece Alanaa. Its been fun to watch Brooks interact with her so we can see how he will be with his new baby brother or sister. For the most part he is gentle with her and a bit curious of this new little creature. He likes to point at her eyes (sometimes in her eyes) and her ears and gives her many kisses (I think he likes the reaction he gets from us after). He has given her at least 20 kisses in the past hour. We’ve also gotten out the boppy and bouncy seat for Alanaa’s visit and to prepare for the new baby. He has tried to sit in it a couple of times and when Alanaa is in it he wants to bounce her alot. So we do have to work on that. Overall, he has really enjoyed having a little baby around. I hope this will continue after the baby is born. Here are some pictures of her visit.